I want you to know it is not easy for me to put up this image on my blog. I only ever share images that show Rolex in their best light but my great Pal Sheldon Smith of www.Minus4Plus6.com sent me an email to let me know he had just finished adding a new section to his Rolex site called "Tough and Broken Rolex Watches." One time, close to a quarter century ago [in the mid 1980s] when I was 18 years old I was having a conversation with my girlfriend Cathy and she said she could not understand why I would pay over a thousand dollars for a stainless steel Rolex Submariner watch. I thought this was strange because my girlfriend before her named Ashleigh liked my Submariner so much that she went out an bought herself a Pepsi GMT Master. Keep in mind this was almost a quarter century ago. I responded to Cathy defensively and proudly by saying "Rolex watches are not only timeless but they are indestructible!!!" She looked at me like she was not very impressed. I took my Submariner off my wrist and said to Cathy, "You want to see why a Rolex costs a thousand dollars!?!" We were standing in a kitchen with a hard tiled floor. I lifted my hand as high above my head as I could and threw my Submariner at the floor as hard as I could. It bounced and made a loud thus noise. You should have seen the shocked look on her face!!! For a brief few seconds I had this terrible sinking feeling of worry...I thought, did I go to far and just ruin my beloved Submariner!?! I picked the watch up of the floor and it was flawless...not a scratch or a ding. In retrospect I think I lucked out and I have never tried anything foolish like that again. Back to the story about Sheldon's new page. Today, all Rolex watches come with Synthetic sapphire crystal which typically will NOT scratch. As I understand it, Synthetic Sapphire will shatter before it scratches. Prior to Rolex using synthetic sapphire they used jet-plastic acrylic crystal which is what airplane windshields are made of. Jet-plastic will scratch like crazy but will not shatter. Sheldon points out "Rolex watches are known for being tough. Here are some images that show the extreme." 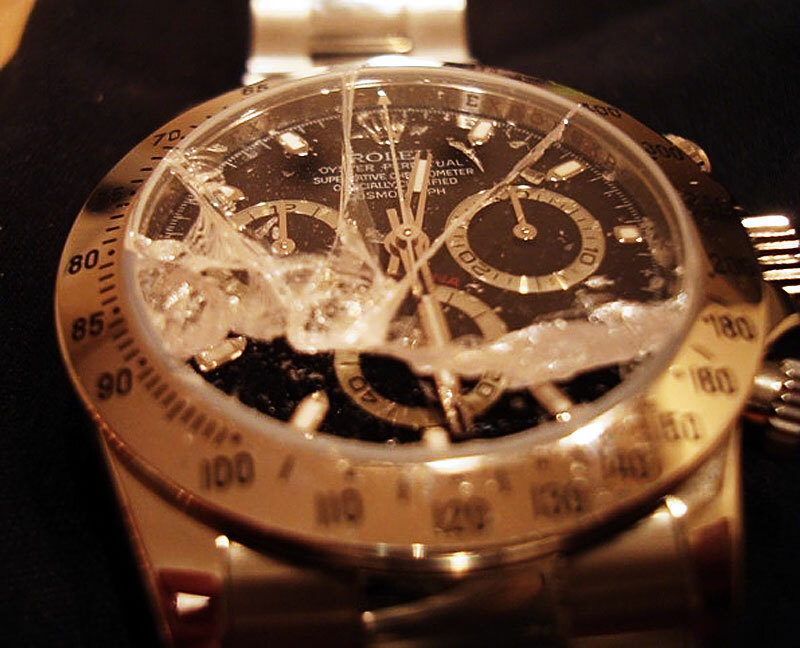 To see some extreme examples of Rolex watches that have taken too much abuse you can visit Sheldon's new and fascinating page by clicking here.